Surinder Sandhu started his musical journey after discovering his grandfathers battered old clarinet from India. After a bit of sweet talking, he managed to convince his grandfather to let him have the instrument...via the boss (his grandmother). He developed an obsession for great Jazz, in particular Duke Ellington, Ben Webster, Charlie Parker, Dexter Gordon, Sonny Sitt, Dizzy Gillespie, Paul Gonsalves among others. As he reached his mid teens, Surinder reconnected with his Indian music love and moved to Delhi in India to study in the traditional Guru-Shishya-Parampara (Guru-Disciple-Tradition) under master Sarangi player Ustad Sabri Khan. Here, Surinder spent the next few years under the watchful eye of the maestro. As a British born Indian, Surinder had been exposed to some fantastic music of the western world, artists like Earth, Wind &Fire, James Brown, Prince, The Jacksons, Motown artists, Grover Washington Junior, David Sanborn. This background certainly played a part in what later became a major part in his career, composing. Surinder Sandhu has established himself as one of the most inventive, exciting and talented composer/soloists both in the West and East. So much so, that for his debut album SauRang Orchestra, he had an outstanding array of A list maestros falling over themselves to work with him! On that first record, which was recorded over a 12 month period in three continents, Surinder enrolled among others; The Royal Liverpool Philharmonic Orchestra, Guitar Legend Steve Vai, British Saxophone hero Andy Sheppard and many eminent Indian soloists. SauRang Orchestra won critical acclaim the world over, catapulting Surinder Sandhu into major league music circles, where he was publicised even through mainstream media, along with credible pop acts. In 2004 (after recruiting a team of undiscovered talent) less than a year after releasing SauRang, Surinder returned with Cycles and Stories. This incredibly fresh sounding record featured his current line up focusing on capturing the energy from the live shows. 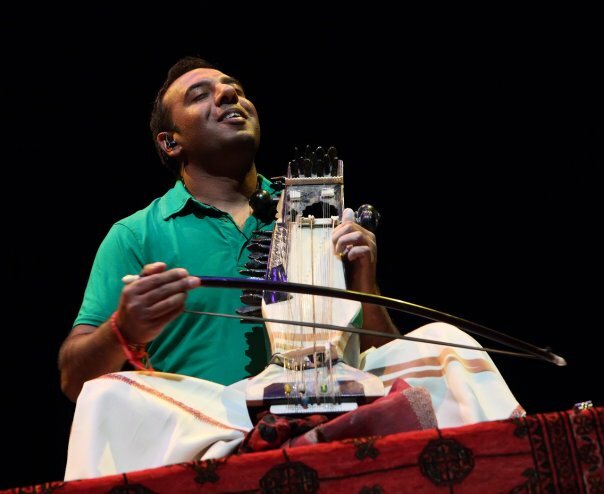 ​Aside from touring internationally, Surinder is in constant demand as a recording artist, composer and lecturer in contemporary music. ​Following his highly successful collaborations over the past 10 years, Surinder was composer and producer of choice to create a special piece to celebrate Liverpool City Of Culture 2008. ​His third outing The Fictionist, described as an epic symphonic collage, featured the Liverpool 08 Commission. ​The project developed such a strong passionate following from fans and industry peers respectively, allowing Surinder to rope in high profile collaborators, such as the music production team behind the US TV hit 24, Sonic Distribution (providing tens of thousands of pounds of high tech recording equipment, BBC Choir of the Year Sense of Sound, BBC Jazz artist of the year Dennis Rollins, African Kora maestro Tunde Jegede, Black Voices Choir and other special guests. ​The live shows had also been gaining a glowing reputation for its incredible musicianship, dynamics, visuals and of course music.